Petsafe Staywell Pet Door. Hard wearing flexible flap with UV sun protection. Fits most doors and walls. Closing panel & fitting screws included. Overall size: 502.6mm x 329.1mm. Cut out size: 451mm x 277mm. Staywell Doors. Maximum pet weight: 18 kg (40 lb). Maximum pet shoulder width: 219 mm (8 5/8"). Pet Max shoulder width: 219mm. Cut out size: 281 mm x 237 mm (11 1/8" x 9 3/8"). Cut out size: 281mm x 237mm. Wicklow - Staywell® Aluminium Pet Door- Extra Large White. Easy to maintain, clean and operate, the pet door also includes a closing panel for when it is not in use or you want to keep your pet in. This provides pets with a greater freedom of choice end extends the areas in which they can self-exercise and explore. 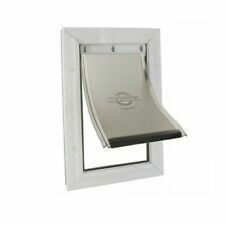 Pet Door Aluminium White Extra Large 2 Way Staywell. Condition is New. Dispatched with Royal Mail 2nd Class. Suitable for small sized dog, cat up to 7kgs/15lbs. In new sealed condition. Shelf wear to box. See photos. Large (640) Pet Max shoulder width: 135mm. Pet Max shoulder width: 213mm. Pet Max shoulder width: 264mm. Pet Max shoulder width: 352mm. Small (600) Suitable for cats up to 7kg and small dogs. 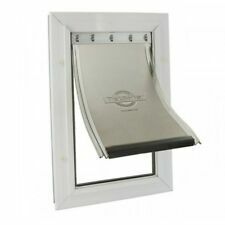 Aluminium Small Pet Door 600 - Heavy Duty White Finish with. Maximum pet shoulder width: 132mm (5 3/16"). For More Information. No moor getting up late at night. Cut out size: 245mm x 150mm (9 5/8" x 5 7/8").